Escape to Ocean's Edge at Sandy Key .... where the sand will tickle your toes! Watch the dolphins frolick or, if you're lucky, a Blue Angel fly-by from your top floor corner balcony overlooking the Gulf of Mexico. This 8th floor, three bedroom, two bath condo was extensively remodeled in 2017 with custom touches. Explore your culinary talents in the brand new coastal kitchen with wave glass tile backsplash, Cambria countertops and upgraded stainless appliances. "Seaside", the master bedroom has a king bed and en suite bath with walk-in shower and shares the main balcony with the living room. "Island View", the first guest bedroom has a king bed and private balcony with views of the Gulf Island National Seashore. "Surf's Up", the second guest bedroom shares two full-size beds with custom surfboard headboards! Relax in the coastal living room with a 37" TV, free WiFi, Blu Ray/DVD player, DVDs, books and board games. Choose your dining options: dining al fresco on the balcony, seating for six at the dining room table or belly-up to the kitchen bar. 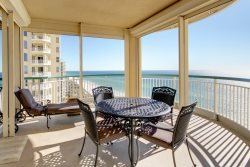 A PERDIDO REALTY PREMIER PROPERTY: For those who expect the best, Sandy Key 821 is included in our collection of outstanding vacation properties and is guaranteed to please our discerning guests. I always have a great stay at all the properties. This property (Sandy Key 821) was just newly renovated and was awesome. Great job condo owner. The beaches are always clean and not crowded also. I am glad 8 years ago I happened upon Perdido Realty. The condo was beautiful. The beds were great and the washer, dryer, dishwasher all worked great. The view from the balcony was beautiful. The beach chair people were awesome! Worked with us well in handling multiple payers for stay and helping me narrow down the perfect condo for our purposes at Sandy Key. So glad you handled all the bookings for BEGA instead of the condo folks...much nicer to deal with. I still have your information...won't book with anyone but you! Thank you so much for a wonderful time! The attention to detail to provide so many little amenities like books, games, films etc was amazing. Everything was wonderful. We will definitely recommend and hopefully return.